Croutons can be made from any bread but the best breads to use Turkish, Italian Ciabatta, or Sourdough because of their firm texture and crust. Rye bread also makes a tasty crouton, especially suitable for salads and thick hearty soups. Should the crusts be cut off? The choice is yours. 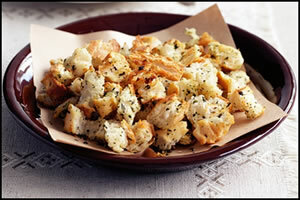 Cut bread into cubes or break into bite-size pieces, then place in a large bowl. Combine garlic, thyme, oregano and oil in a jug. Pour over bread. Toss to coat. Arrange bread mixture, in a single layer, on prepared tray. Bake for 10 to 12 minutes or until browned and crisp.